The company M.C.A. was established in 1978 by its managing partner, a former helicopter pilot and lover of the sea, with extensive experience as a professional skipper since 1975, in Portugal, the Balearic Islands, Turkey, Brazil and the Caribbean. For 35 years we transported thousands of tourists in coastal cruises, visits to caves and BBQ (s) on the beaches. Departures also at: 11:30 am. Visit the inside of the caves at S.Rafael area. Stop for swimming. Departures also at: 4:15 pm. Cruise along the coast to see the beautiful rock formations and caves(S.Rafael, "Arco dos Namorados", etc) going to the entrance of BENAGIL CAVE. Stop for swimming. Cruise along the coast to see the beautiful rock formations and caves(S.Rafael, "Arco dos Namorados", etc) going to the entrance of BENAGIL CAVE. Disembark at one of the authorized beach to serve a BBQ lunch and visit the interior of the caves with the auxiliary boat. Cruise along the coast to see the beautiful rock formations and visit the interior of BENAGIL CAVE with the auxiliary vessel. 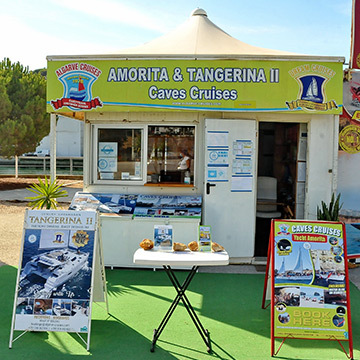 During the cruise also with the auxiliary vessel, visit the interior of the caves located at Benagil area. Includes snack lunch on board. Stop for swimming. A link or an email address was detected on the name subject message and was not possible to send your message. The maximum number of emails sent was reached.